Woodside, a nearly forgotten community in the eastern part of north Newark, is one of the city's oldest neighborhoods. It is not a large area, but it is one that has had a tremendous effect on the city. In more than two centuries of existence, Woodside has been part of Newark, part of Belleville, independent for a couple of years, and then reincorporated into Newark. It has tended to share more then a common boundary with the neighboring Forest Hill section. In 1909, C.G. Hine wrote of the area in a book titled 'Woodside: The North End of Newark, N.J. Its History: Legends and Ghost Stories Gathered From the Records and the Older In habitants Now Living.' This charming 310-page publication described Woodside's early history before 1866, including recollections of the residents and many anecdotes from the author's association with the community. A copy is in the library's New Jersey collection for those interested in learning more about Woodside. According to what is called the 1849 map 'Twelve Miles Around New York,' Woodside's eastern boundary was the Passaic River. The northern was Second River (Newark-Belleville line); the western was roughly the old Morris Canal (today the Newark City Subway), and the south was Bloomfield or Second avenues. By the eve of the Revolutionary War, Woodside began to assume an identity of its own, largely by manufacturing several products and growing its own agricultural goods. In 1776 residents claimed to have entertained Gen. George Washington during his famous retreat that fall. In 1779 they complained that the 2,000 troops stationed under 'Mad' Gen. Anthony Wayne damaged their crops and cut down their trees. Earliest Woodside residents were attracted by the abundance of the Passaic River's fish and nearby wildlife. Charles F. Murphy, veteran Newark angler, and inventor of the bamboo fishing rod, raved about a four-foot long sturgeon that 'sprang out of the water and fell back again with a splash, like a man diving.' He argued that 'smelts were so thick that people wouldn't take them home, and that shad could be had for a song.' He further claimed that the river was so clear that one could see 'thousands of bass, perch, pickerel, sunfish, catfish, suckers, salmon and smelts on the bottom.' Others commented on the richness of the land, saying that 'snipe, woodcock and rabbits were as thick as hops.' Indeed, the fauna was so plentiful that famed 19th century sports writer William Herbert (who wrote under the name Frank Forester) moved here from New York to write more than 30 books in his Woodside home. While this sylvan corner of Newark was described in 1830 as 'a lovely place with all the quiet charm of a Constable painting,' by 1849 the area had begun to shift from 'forest' to recreational hunting, farming, residential and eventually a light industrial character. In fact, the Sidney map referred to previously reveals that there were 100 houses, a canal, a copper works, a rolling mill, a lime kiln, a calico print mill, several rural inns and hotels, a boat house, as well as several dozen farms or homesteads. By the middle of the last century change had become irreversible. Canoeists, rowers and pilots of steamships made use of the wonderful Passaic. The old Point House, halfway between Newark and Belleville, was used as a sometime restaurant. Called Ed Holt's 'Floating Palace' it was anchored in mid-river where he could serve liquor without a license. The Belleville Hotel, a German rathskeller, was located on the site of the Wallace and Tiernan factory, and the Pagoda Inn was set up as a country tavern by an old China trade sea captain as a place for food and drink. All sorts of rowing clubs later developed along the river bank, lasting well into the last century. Steamer service for pleasure boat outings to Coney Island and Long Branch allowed access for those traveling beyond the city's boundaries. All sorts of people have lived in Woodside. The first settlers were English, Scottish, Scots-Irish, Irish, German, and Dutch. A partial list, compiled in 1850, illustrates that diversity with names such as Coeyman, Alexander, Smith, Munn, Sanford, Small, King, Van Cortland, West, Anson, Murphy, Davis and Ferrand. Interesting residents included such personalities as John Dryden, founder and president of the Prudential Insurance Co. of America; Peter Maverick, 'early America's most famous lithographer and engraver, ' and Henry J. Winser, 'adventurous newspaperman and diplomat.' Winser was a reporter for the New York Times, where he battled New York's infamous Tweed gang. In Newark, he became editor of the old Newark Daily Advertiser, served in a diplomatic post to Germany, and was father of longtime Newark Library and museum director Beatrice Winser. John Morris Phillips of the old firm of Hewes and Phillips supplied turret machinery for the Civil War submarine the Monitor as well as parts for John Holland's first submarine, manufactured at Paterson, N.J. So unique was Woodside, it was even credited with a large share of Newark's ghost stories. Some claimed that a headless apparition haunted the Back Road, and that this was the ghost of a young woman murdered and thrown into a local stream. The Gully Road also is supposed to have hosted a phantom British spy who roamed the night, and there were even rumors that a dead man lingers to protect the booty of Captain Kidd, supposedly buried along the river bank. Sgt. Tom Adubato quashed the story of a Lover's Lane ghost when he hid behind a tombstone in Mt. Pleasant Cemetery and apprehended a sheet-covered nocturnal peeping tom. Time and space does not allow the opportunity to identify all of Woodside's many landmarks; however, there are several that we must mention in order to give a feeling of the place. 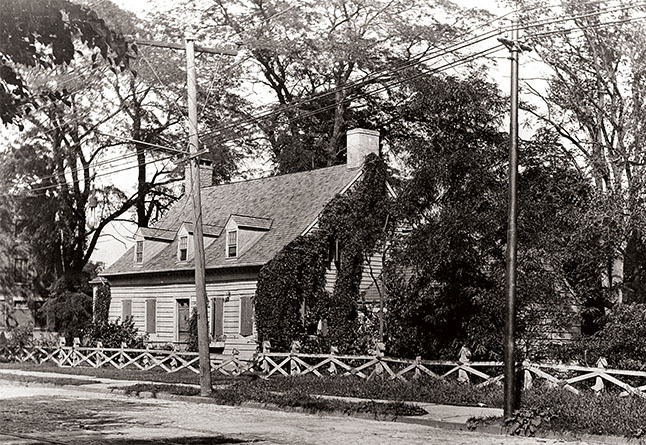 The city's oldest private residence is the Sydenham House, built about 1710 by John and Susannah Sydenham at what is now the Old Road to Bloomfield between First Street and Elwood Avenue. The building is significant, not because it is a mansion of a wealthy colonial family, but because it is a good example of the home of a prosperous 18th Century Woodside farmer. Sydenham House actually consists of two houses built side-by-side. The earlier construction is a 'saltbox, ' built on a foundation said to have been the site of an Indian meeting place. The newer, higher portion of the house was completed about 1836. For the past 40 years the owners, D.J. and Elizabeth Henderson, faithfully worked on its restoration. Eventually, it will be presented to The Newark Museum when the current owners are no longer around to love and protect the property. The Old Point House, which stood on the river near Mt. Pleasant Cemetery, served several functions during its existence. It was a haven for anglers and a supply point for the fishing industry. It had a good reputation as a restaurant which made a good fish chowder. Later, it was a fireworks factory, and became a half-way point for rowing teams from Newark and Belleville. The Kearny Homestead on Broadway was the boyhood home of Civil War hero 'Fighting' Gen. Phil Kearny. Although Kearny was born in New York City, he spent much of his boyhood at the homestead that was demolished early in this century to make way for the building of the old Newark Normal School, later Newark State College. Today, the building houses the Newark Manpower Skills Training Center. In 1911 efforts were made to retain the old wooden building as a historical site, but its time had come. In the name of progress, it was razed. Gone forever were the broad fields that swept down to the Passaic River, the kitchen gardens, and the apple orchard where a future general played as a boy.